Thank you to all who came out for the 18th Annual Eagle Watch festival. Over 800 visitors ventured to the cliffs that tower over the confluence of the Metolius, Crooked, and Deschutes Rivers to view raptors, participate in activities, explore yurts, and eat our world famous hotdogs! With the help of multiple Oregon land management agencies, The Confederated Tribes of the Warm Springs, and many volunteers the event was a great success and very memorable. My personal favorite moment was after a weekend of searching for eagles, one finally appeared as it circled high in the sky after the tribal dancing began. So amazing! View the gallery below for more highlights from this event, and we hope to see you out next year! A Campbell’s Condensed Cove Soup Update! Hey there readers and Cove Palisades State Park enthusiasts! We apologize about the little “lull” in our posts the last couple weeks. Many of our rangers have been away at Camp Rilea in Astoria for POST (Professional Officer Safety Training) Academy, and have had no time to “post” in a blogging fashion! But we are back for a few days and ready to spread the word about some neat opportunities coming up, and some cool projects we’ve been working on. A friendly game of Duck-Duck-Goose? 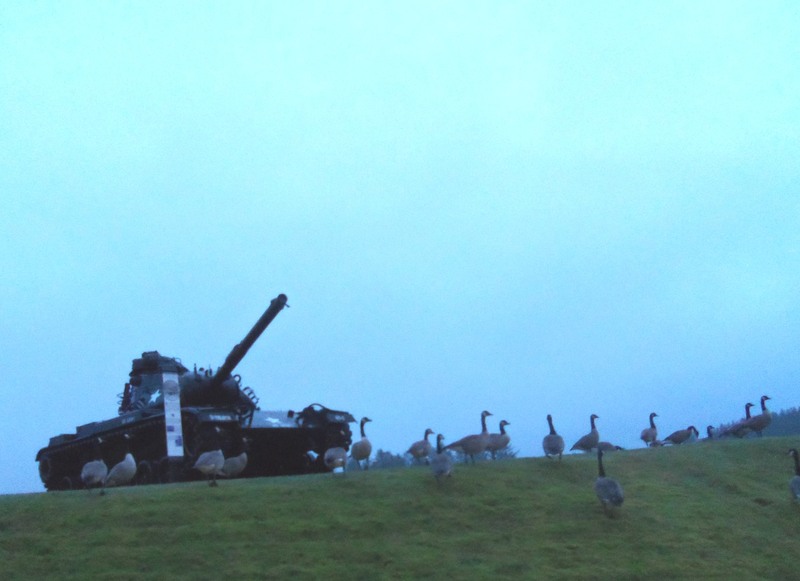 Or an advanced Goose invaders hazing technique? Whatever the ploy, it looks as if the Cove and Camp Rilea share the goose management challenge in common. Our park just finished a MASSIVE juniper thinning project along the Overlook Rd., it took nearly two weeks! If you don’t know much about Western Juniper trees, they love to encroach, meaning TAKE OVER. With their huge hungry branches, they were sprawling and taking over the pavement, making our neighbors and those visiting the viewpoints play a feisty game of limbo to make it to the end of the road. With Ranger Jay at the lead, it was time to trim em up, knock em down, and mop em’ up! We also had the awesome opportunity to have a presence at the OSU College of Forestry Society of American Forester’s Job Fair (phew! that’s a mouthful) to help recruit for seasonal Ranger Assistant and Interpretive Naturalist positions here at the park, in the Mountain Region, and statewide. It was really great to interact with prospective job hunters and answer their questions about what it’s like working for OPRD. 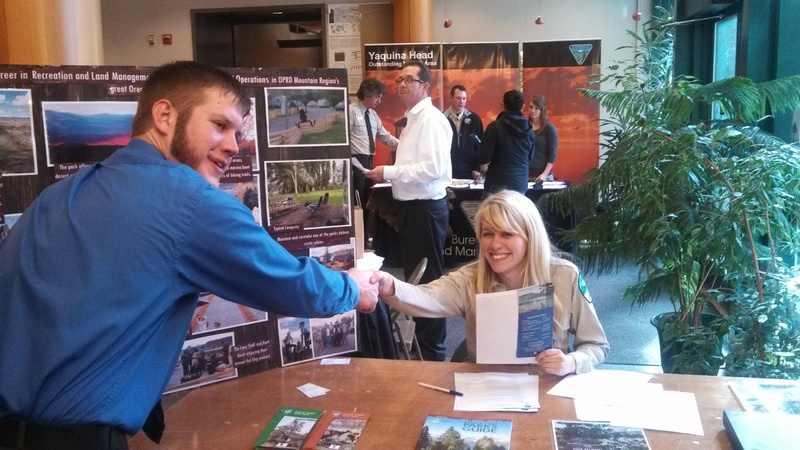 It was very inspiring to meet so many people interested in working for Oregon State Parks and pursuing a Park Ranger career….Go Beavs! Ranger Talia also got an opportunity to share her park experiences with Recreation Resource Management classroom in a lecture about managing natural resources for human impact. Ranger Talia successfully recruiting a potential future high-quality Park Ranger! At the time, the Cove crew is getting ready for the grand Eagle Watch 2013 event taking place at the Round Butte Overlook Park. 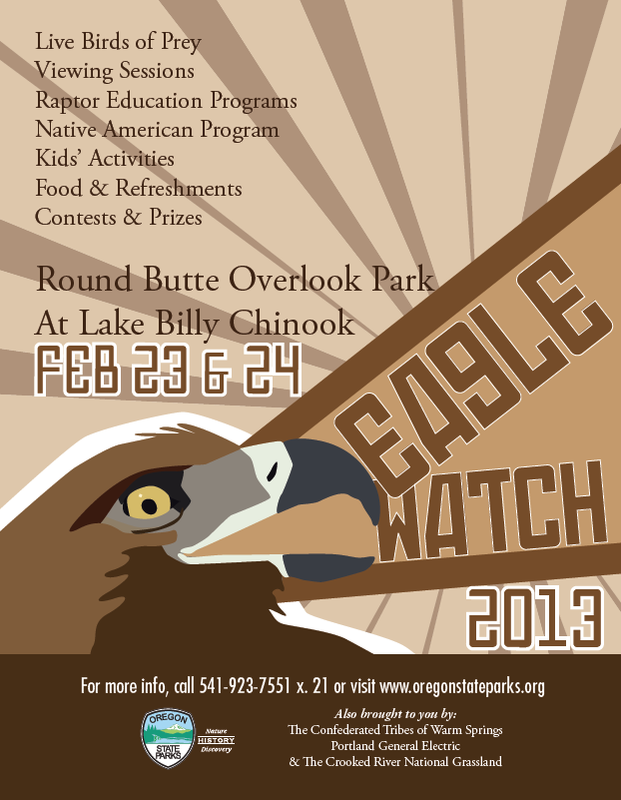 This is our biggest event of the season, with over 1000 people showing in the past to watch the famous raptors of the Cove and learn all about the Bald Eagles, Golden Eagles, and other raptors that swoop the canyon walls of Lake Billy Chinook. We are hoping this year’s event will be our biggest yet and would like to cordially invite YOU to come on out and visit the Eagle Watch yourself, it’s a blast! Free admission, great views, awesome yurts with tons of information on birds of prey and Oregon’s High Desert. Come say hi to Ranger Talia, she will be running the kids tent with some great surprises to take home!